Get reacquainted with the no-tech fun of this classic toy. 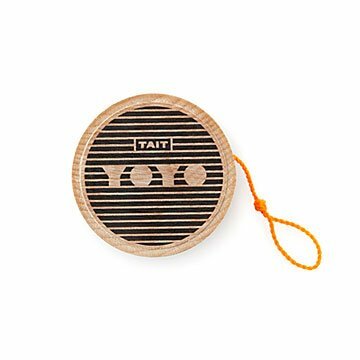 What is a Yoyo? Correct. It's also a classic toy with infinite trick potential—from Walking the Dog to the Elevator. Get reacquainted with its no-tech charm and meditative motion through Matthew Tait's hand-turned, hard maple design. Comes complete with string because, you know, without that it would just be a "Yo." Maple body handmade in Yarmouth, Maine. Assembled in Madison Heights, Michigan. Matthew Tait is an artist and product designer based in Detroit, Michigan. Through his studio TAIT Design Co., founded in 2013, he has launched a successful line of products ranging from small well-crafted functional toys to handsome and detailed pieces for the home. His work exhibits a refined touch and focuses on product experience and functionality, with an exceptional eye for detail, use of material, and form.